Within months, young men from across Europe faced each other across the contested soil of France. Young men like Joe Flynn, the fastest runner his regiment had ever known. He would need every ounce of that speed to survive. In the armoured car were a young, half-dead British officer and an Indian soldier. Up against them were four Japanese jungle-troops — deadly and lightning-fast. What chance would they have against scores of men like these? Read “DUEL IN THE JUNGLE” and find out! If you can get past that evil-looking knife on the cover, there is a clue as to how this story is going to go. British soldier attacking British airman? That’s not right, surely. Stories of tribal allegiances on debts of honour are far from unknown in Commando but, as usual, Eric Hebden manages to twist and mix the threads together to weave an original blend. Also, as usual, there’s a little unexpected turn towards the end just to wrong foot you. His characterisations are well supported by that doyen of war comic artists Victor de la Fuente. Victor’s faces are full of life but his figures have the rare quality of seeming to move within a static frame. It’s not by chance that he is held in high esteem by comics fans…as you’ll see inside. By 1945 Berlin was in ruins and its eventual fall to the advancing Russian forces was inevitable. Britain’s war with Japan in 1941 held little interest for American tramp-steamer skipper Charlie Donahue and his buddy. They had no great love for either country. But following the Japanese attack on their country at Pearl Harbour, their interest was rapidly kindled, particularly when they were forced into an uneasy alliance with a unit of British Royal Engineers who commandeered their ship. This understated classic is not particularly bombastic or gung-ho, and instead concentrates on the clash between a Royal Engineers Captain and a cynical civilian Yank sailor. 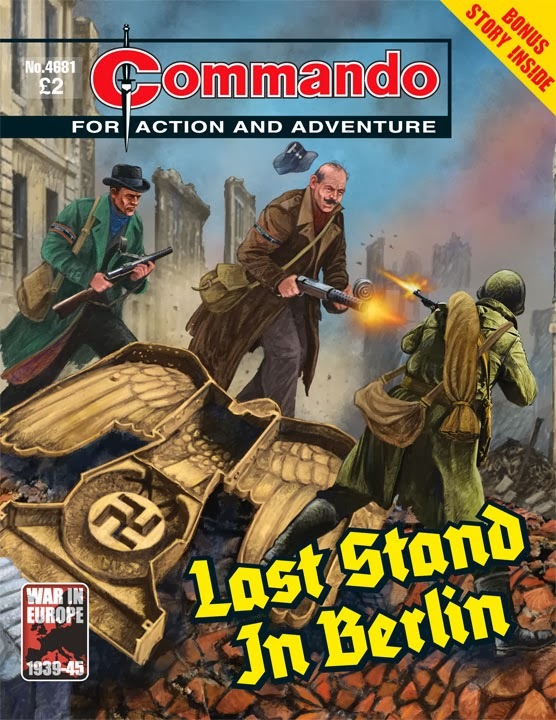 However, it also serves as a reminder that Commando can easily flit between, or even merge, genres – something more commonly known as a ‘mash-up’ these days. In this case, a gritty jungle tale meets a seaborne adventure – with memorable results. No poster this time. And the inside back cover of each issue contains part of a prose story from one of the old boys papers. Thanks for the info James. I haven't seen the issues for myself yet so I was wondering what that extra story was. So the reader has to buy all four issues to follow the story? Yeah. It's a Sniper Dennison story from The Wizard (apparently he later appeared in comic form in Victor).